When we finish the component selection and the target response has been achieved there is always the possibility to simplify the topology we used without seriously affecting our goals. This is the task we will investigate in the following paragraphs. -Are we done with our two-way speaker example ? No, it is not that easy to really finish with a crossover network! Having a total SPL response very close to a target curve does not imply that the group of your network components is the only one to achieve this objective. In time a designer discovers that some of the components can either move to a more convenient value or be removed completely without noticeable change of the SPL response and with no serious degradation of speaker impedance. Anything having these digits goes: you will find resistors at 12 ohms, 330 kohms, 0.56 ohm, 10 ohms, 0.12 uF 15uF 220uF 3.3uF etc. Inductors are made of wound copper wire. So manufacturers can easily mass-produce any value. They usually choose to sell the E12 series to stock houses at low prices. In many countries you can place your order to local hifi DIY stores equipped with a copper-wire winding machine. In this case you can order your own inductance values. Of course if you want to have a 4.40uF capacitance in a crossover network you can easily put two 2.20uF capacitors in parallel. But this is a decision that reflects a serious increase of the network's cost and the pcb's area. Several DIYers would simply measure their stock of 4.7uF/10% capacitors and use the piece that is close to 4.40uF. After all using two (nominal) 2.20uF/10% capacitors will not definitely result to a total of 4.40uF. Speaker industry simply uses 10%-tolerance or more, components, whatever the impact of value inaccuracy is to the SPL response of the end-product. Usually a QC measuring device at the end of the production line checks for SPL curves falling outside a predefined dB zone. DIYers have the luxury of building 'prototypes', to use an industry term! In that sense they can have excellent component-value and SPL response accuracy in their end-product. Now let us try to remove small parts of our last crossover network circuitry just to make sure that it actually has an important impact on the overall SPL response. Usually the first part we question are the impedance compensation subcircuits (ICS). Their effect in lowpass filters is almost always very serious and they can not be removed. 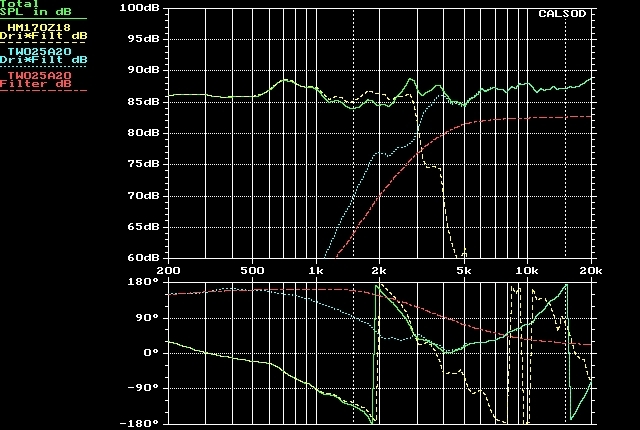 On the other hand this is not always the case for the highpass filter. 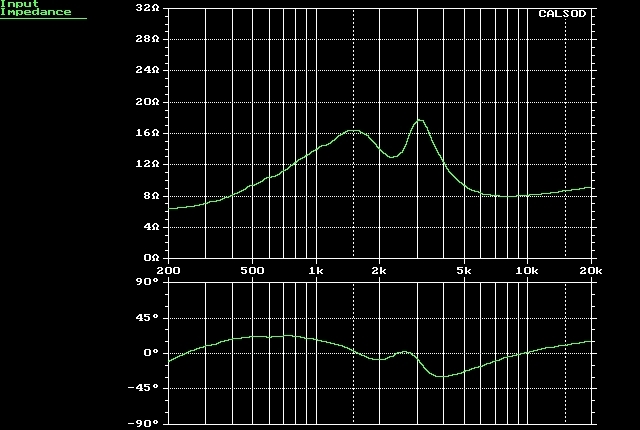 After all those changes and component removal the impedance degrades seriously: It swings above the 16 ohms value though it does not drop below 8 ohms at high frequencies which is a very good achievement. Phase swing does not exhibit any strong deviation from resistive nature; it is well kept below the +/-30 degrees zone. Of course all these results hold above 200Hz. Depending on the speaker category we may choose to regard this crossover design final or not. Extensive crossover optimization needs a great amount of man-hours not always balanced by the quality of the results. 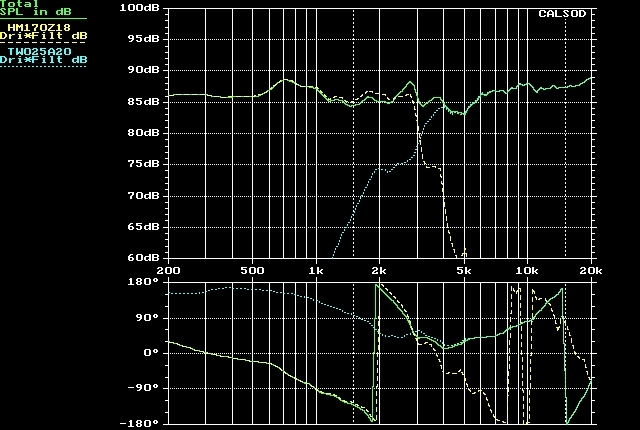 After all it is our duty to remember that human hearing sense is very insensitive to small changes of a speaker's SPL response curve. A successful designer must know which changes have major impact on listening assessment.